Uh-oh! Fantasy just collided with reality. Last month, I went to Hong Kong, the ultimate adult candy store. This month, I'm paying the piper. All those cute little plastic cards that buzzed so beguilingly: "Use me! Use me!" have put out a contract. Pay up. Imagine a glorious pinball machine, all lights and action, like a slowed down version of New York with a San Francisco Bay setting and lighting by Las Vegas. It's the fastest city on earth. My bank balance and I are both reeling, but oh, the memories-and the goodies. Hong Kong is Asia's happening city. Described once as a capitalistic boxing ring where the ambitious gathered to slug it out, the 1997 handover to the People's Republic of China has only served to accelerate the pace. Hong Kong's skyline-call it harborline-changes more quickly than any city in the world. Many of those new buildings are banks-and the amount of money turned over daily places Hong Kong third in the world. Small wonder it's the world's most materialistic city. Warning: go there and you get the fever. Maybe that's why you went in the first place. I did. 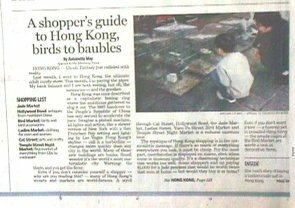 Even if you don't consider yourself a shopper-why are you reading this?--many of Hong Kong's streets and markets are world famous. A stroll through Cat Street, Hollywood Road, the Jade Market, Ladies Street, Yuen Po Street Bird Market, and Temple Street Night Market is a cultural museum tour. The sheer spectacle of any one of these is worth the potential risk to your wallet. The mystique of Hong Kong shopping is in the not so subtle message: if there's so much of everything everywhere you look, it must be cheap. For the most part, merchandise is displayed en masse even when some is museum quality. It's a disarming technique that works too well. Some shoppers end up paying $1000 for a jade pendant that would be worth twice that sum at home. But would they buy it at home? Others spend far too much for baubles they wouldn't even consider at a local department store. But, of course, that's the whole idea, the Hong Kong gestalt that clamors: "It's a bargain! Buy now, while you have the chance!" The rude awakening comes with the credit card bill. Still, there is life after vacation. I'm not sorry. Just broke. I thought I'd died and gone to heaven. If you love jade, this is the Emerald City. The area, between Kansu and Reclamation streets in Kowloon, is actually three blocks of jade merchants, working from small stalls. Some of the jade is real, some isn't. How can you tell? 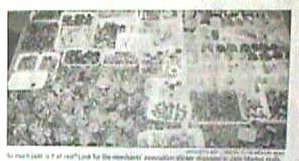 Probably you can't, but most of the vendors are licensed and belong to an association of jade merchants. Proof is displayed on a prominently placed sticker. There are necklaces, bracelets, rings and charms. Expect to see pyramids of emerald beads, baskets of small carvings. Starting prices may range from $1 to $1000 dollars. Though you'll find jade in nearly every color, most of it's green, green, green and so gorgeous. Decide what you want and go for it, then counteroffer whatever price you're quoted by half. Stay calm-it's hard not to be overcome by the excitement-and bargain politely. It's a way of life here as in most of Hong Kong. When I first walked into Dragon Culture at 231 Hollywood Road and saw hundreds of terra cotta horses lining the halls and crowding the shelves, I thought they must make them there. Wrong! Most of the statues are more than 1000 years old and come from the tombs of Mainland China. The owner, Victor Choi, an internationally known author, collector and art historian, has a breathtaking collection of Tang and Han pottery. Warning: these ponies don't come cheap. Yet even if you can't afford them, it's fun to look. The store's atmosphere is much more intimate than a museum and the well-trained staff give a detailed introduction to the background of each artifact. Should you choose to buy, items come with a certificate from Oxford Authentication Ltd.
Choi insists that one can begin an antique collection with as little as $100. I thought of this while exploring the hills and alleyways of Hollywood Road. Hong Kong is Mainland China's antique clearing house, Hollywood Road with its fabulous array of terracotta, porcelain, lacquerware and screens, holds the crème de la crème. It began as a street of teahouses where men took their birds for an outing. You don't see so much of this now, but you do see hundreds and hundreds of birds for sale. It's difficult to imagine the immense popularity of birds in Hong Kong. Space is so limited that keeping a dog or cat is often impossible. A pet bird is a compromise that almost everyone makes. Not only do birds offer music and companionship but also luck (some take their fine feathered friends to the races). It's fascinating to stroll down Yuen Po Street. Not only can you see every type of bird imaginable, but also every kind of bird accessory. Hong Kong birds live very, very well. Some are hand fed with silver chopsticks. Others live in gorgeous antique birdcages. Many of the cages, which range in price from around $10 to $10,000 make elegant and distinctive ornaments without the birds. Mong Kok may be Hong Kong's busiest shopping district, the name in Cantonese aptly means "prosperous corner." At its center is the Ladies Market. This five block area used to be off limits to men, but then, where do you park your boy friend? Now, you see both men and women wandering from stall to stall inspecting the incredible array of blatantly seductive lingerie, beaded bags, terrible ties, cosmetic and wigs. Don't expect high fashion or hovering salespeople. This is where the locals go to buy everything--and everything is what you'll find. Oh, if this street could talk! Cat Street used to be the haunt of cat burglars who brought their stolen goods here to be fenced. Now its been morphed into an elegant arts and crafts center. While strolling among the galleries, it's fun to imagine which were opium dens, which Suzie Wong houses. One thing for certain, the old pirates who once frequented the area would be truly shocked at the prices charged here today. You'll find everything you could possibly want in the way of ancient and modern art, but don't forget to bargain. Named for the Tin Hau Temple, the Temple Street Night Market is the liveliest in town. Hawkers set up shop at 6 p.m. and go until midnight. From 8 to 11, its body to body shoppers. This is the place to go for designer knockoffs, pirate CDs, cookware, watches, cameras. Everything seems to end up here. The street extends from Man Ming Lane on the north to Ning Po St. on the south and is divided in two by the Tin Hau Temple where you can nip in for a quick prayer to the shopping goddess and a little respite from the madding crowd. Once back in the market, you can get anything from a simple bowl of noodles to a pleasant meal, served at your own table on the street-a nice way to rest and reconnoiter between campaigns. The true shopaholic is like a general mapping out her battle plan. Strategic skills are often tested. The above markets are must sees, cultural treasuries as well as grand bazaars, but serious shoppers will also appreciate the ease and guaranteed quality of "establishment" meccas. The shopping arcade holds designer shops and boutiques, department store bHilles, tailors and the aforementioned jewelry shop. Since tea at "the Pen" is an institution, it's fun to take time out to watch the Beautiful People. The lobby with its soaring pillars, luxurious carpets and furnishings is the place to see and be seen. Listen to the musical quartet while pondering the eternal to buy or not to buy question. You'll find a bHill of SHANGHAI TANG at the Peninsula but you may also want to go to the source in the Pedder Building on Pedder Street, in Hong Kong's central district. Shanghai Tang is the place to buy slinky Chinese dresses, elegantly sequined T-shirts, embroidered sweaters. You can spend a lot of money here very fast but you'll love what you buy. It'll be well made, and you'll enjoy wearing it for a long, long time. Another favorite is CHINESE ARTS & CRAFTS, Ltd., in the Silvercord Bldg., Canton Rd., Kowloon. This splendid department store really has it all. You can find gifts for everyone on your list. Consider jade charms for (about $15), jade chops inscribed with the recipient's name (about $40), miniature trees with green jade leaves and pink jade blossoms (about $80). American Airlines flies from San Jose to Hong Kong for $888 round trip. The dare devil, heart-in-your-throat landings at Kai Tak Airport are a thing of the past. The new airport, Cek Lap Kok, sits on a huge chunk of reclaimed land on Lantau Island in the harbor. From there, the Airway Express Railway leaves every four minutes and stops in both Kowloon and Hong Kong's Central district. Hong Kong Island and Kowloon, on the mainland, are linked by Star Ferry, cab or subway. They're only minutes apart no matter which you choose, but I think you'll pick the Star Ferry. It's Hong Kong's greatest joy-next only to shopping. We never thought of staying anywhere but the Pen. Not only does it have 1920s ambience but the ultimate in 21st Century convenience. It also has the Peninsula Academy. We didn't have time to do the whole program but Charles learned to make cute little dim-sum packages while I had a Destiny Consultation. (The future looks very good, thank you.) We might have had Fung Shui Chinese Medicine sessions or a Tea Presentation or a Tai Chi class overlooking Victoria harbor if time had permitted. Rooms at the Pen are pricey. If your budget will allow it, the value of peace, quiet and space can't be over estimated in a frantic, non-stop city like Hong Kong. On the other hand, if you'd rather spend your bucks on duds rather than digs, consider: The Stanford Hotel, 118 Soy St, Kowloon, 1-800 715 7666, is conveniently located within walking distance of the Jade, Bird Ladies and Temple Street Night Markets. Can you ask for a better location than that? On the Hong Kong side, the Wharney Hotel, at 57-73 Lockhart Rd., in the Wanchai district. Tel: (852) 2861-1000. Fax: (852) 2865-6023. In Hong Kong, they don't ask, "How are you?" The universal greeting is "Have you eaten yet?" This is a city where dining out isn't a special treat, for most people it's an every day thing. With one restaurant for every 200 people, the competition is keen. In the last weeks of 2001 a contest was sponsored by the Hong Kong Tourist Board. It was called the Best of the Best Awards. The top winner (gold with distinction) in the Dim Sum Category was the Celestial Court in the Sheraton, 20 Nathan Rd., Kowloon. This same remarkable restaurant received a gold award in the crab category for its baked stuffed fresh crab meat with shark's fin in a golden shell. Tel: (852) 2732 6992. The gold with distinction award in the crab category went to Tsui Hang Village for it's steamed egg white topped with crab claws and shark's fin-really good. This excellent restaurant is located in the Miramar Hotel, ll8 Nathan Rd. The same hotel houses another prize winner, the Dong Restaurant which won gold awards in both the Dim Sum and prawn category. The phone for both is (852)2736 0922. Hong Kong's restaurant scene is filled with energy. This is not the place for quiet tete-a-tetes. Tables are crowded, often four generations talking animatedly at once. I loved the noodles, I loved the rice, I loved the whizzing trolleys, the clattering china, the whole eat, drink and be merry ambience. After a few days I'd even mastered chopsticks-sort of. But the evening came when I was ready for a change of scene, something almost homelike. The Annexx (4/F, California Entertainment Building, 34-36 D'Aguilar St., Central) was tailormade. The chef, a young Irishman trained in the Hudson Valley offers classic dishes, poached Idaho trout, rack of lamb, lobster macaroni. Martinis are chilled, music soft and there's not a chopstick in sight. Who goes there? Everybody. This is the new "in" spot. Floor flights above the madding crowd, this is where the trendy locals go. Tel: (852) 2877 9779.